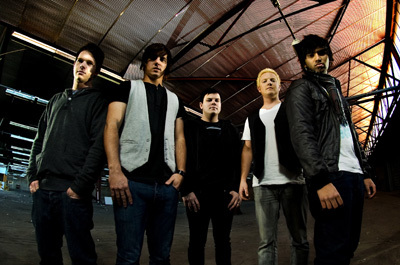 Town Hall Steps are an influential band from Sydney and their hard work and dedication to music has provided them with an Australia and United States tour for their current single 'Ask For More', which is from their self-titled album. Town Hall Steps is made up of five guys who began touring and writing in the summer of 2004. Town Hall Steps spent countless hours establishing themselves in local pubs and other locations around Australia. Their efforts paid off when they were chosen as the opening act for internationally known acts: Simple Plan, Avril Lavigne, All American Rejects and McFly. Town Hall Steps has also supported amazing Australia acts: Kisschasy, Faker, Gyroscope and Something With Numbers as well as many many others. Town Hall Steps track 'Still Alive' has been chosen by Davenport and MTV to be used for the Summer Satin Davenport underwear commercial which you can see on MTV and VH1. Town Hall Steps experiment with a mature electronic sounds alongside their rock band music. The music is contagious, exciting and makes you want to move. Drummer Ryan Lambert says Ask For More "was themed from those nights out with the boys, when every guy is stopped in their tracks by that one pretty girl." "All of a sudden every guy will instinctively act different, trying to make the funniest joke to make her laugh, buying her drinks as if money is no issue and all these things to try and impress her," Ryan says. "What most guys don't usually realize is that girls see straight through this and after all their efforts, usually leaves the conversation with the same impression of these boys as she had when she entered". How did it feel to hear your song played all over the airwaves? Archie Mann: It was awesome, I was at work in the warehouse and it came on the radio and all my work mates heard it and you couldn't wipe the smile from my face for the rest of the day. Did you have any pre-conceived ideas about the music industry? Archie Mann: That it takes incredible amount of hard work and determination to succeed, there are a lot of challenges and hurdles that you must overcome and you cant let them bring you down. Do you write your own songs? What's your inspiration? Archie Mann: Yes we write all of our own songs and we draw inspiration from events in our own life's or those close to us, we also get inspiration from other music. What music/artists do you listen to when you are not playing your own? Archie Mann: We have a very broad range of musical influences between the five of us. For me personally (Archie) it can be anything from the stuff I grew up on like Faith No More, Pantera, Guns N Roses, Pennywise to Radio head, the Killers, Lily Allen, Deadmaus, Justice, JayZ almost anything you can think of. Archie Mann: Were releasing our next single later this year "Still Alive" which is on our debut album, which has just been, released Australia wide on ITunes and in the shops. You may have heard it on MTV and Vh1 as it's the song used on the new Davenport commercial. We will be touring later this year to promote the album and single. Then we will be recording some new songs we just finished writing for album number 2. Was there a moment you contemplated throwing in the towel? Archie Mann: There have been very tough times, which tested us individually and as a band, but we have always looked ahead and never ever thought about throwing in the towel. I guess we all want this too much to give in. Do you prefer performing live or recording? Archie Mann: We love recording because its where we can hear our songs and ideas come to life in the studio, however playing live is what we love the most as it is where we can connect with our fans and the energy and high we get from that is awesome. What/who was your inspiration to go into the music industry? Archie Mann: For me (Archie) it was my dad who got me into his old records like Deep Purple, Jimmy Hendrix and all the other awesome music he listened to and gigs he used to go to back in the UK.I wanted to be like slash one day lol! What is the biggest challenge you have faced along the way to your musical success? Archie Mann: Biggest Challenge would be avoiding all negative influences and staying focused and believing in my dream. Archie Mann: Get up 7am, check emails-shower. 8am- Arrive at work, do my dayjob. 12-1 Go to the Gym (it's hard with band practice of an evening) Make any phone calls/emails as well. 8.30-11.30- Travel to band prac and drive home. What has been your favorite part of becoming a music artist? Archie Mann: I'm very lucky to work with 4 great guys who are extremely talented who I share the same dream with! If you could collaborate with another artist, who would it be? Archie Mann: Oh there are so many, if only Lily Allen hadn't given up music! She's very cute and cheeky- I think she would be great fun! Jay Z - he is just AMAZING! Are you single? What do you look for in a partner? Archie Mann: I actually got engaged earlier this year! But I wasn't looking- which is usually the case. Natalie is happy, we have so much fun together but most of all she is supportive! Do you have a website fans can visit? Can you tell us 5 things required for a happy healthy & enjoyable life? 4.Listening to Music, attending concerts. 5.Having goals and pursuing these. Archie Mann: Please support Australian independent music and don't download illegally we spend so much time and money to get our music out there. Yet if you don't buy our music legally we have no record of this and can effect everything from recording to touring. What is the story behind the bands name? Archie Mann: Townhallsteps was an online forum we all used growing up through our late teens and it kinda just stuck! Favorite Food: Vietnamese or Chocolate - I just went to Vietnam and loved it. Pet: I had a border collie Scooby but had to give him away due to band commitments! He's moved to the south coast now right on the water! Person You Would Most Like to Meet: Slash - My hero or Shane Warne! Hobbies/Interests: Gym, Beach and Live Music and spending time with my loved ones. First Job: Mc Donalds- Cheesburger boy! Are you a Pub, Bar or Club kind: I'm now a pub boy- I appreciate a good live band. What Can You Never Leave Home Without: My phone - I'm lost without it. What is the first thing you think of when you wake up in the morning: Lately America as we're off to showcase in Los Angeles and New York in October.